ERROR – C:WindowsMicrosoft.NETFrameworkv4.0.30319Microsoft.Common.targets(3390,5):Unable to copy file “objDebugSage.Entity.Interfaces.dll” to “C:UsersAdministratorAppDataRoamingSagePlatformOutputinterfacesbinSage.Entity.Interfaces.dll”. Access to the path ‘C:UsersAdministratorAppDataRoamingSagePlatformOutputinterfacesbinSage.Entity.Interfaces.dll’ is denied. It appears as though the bin folder is locked, preventing the build from continuing. As long as AA is open, you will not be able to delete that folder manually either. 1. Re-launching application architect: Since AA locks that folder, it remains locked as long as that session is open. Closing AA frees that resource so that you can build properly after logging back in. 2. 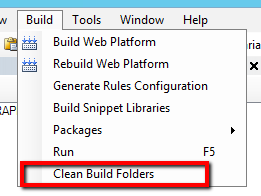 Manually clear the build folders instead: Instead of using that menu item, simply delete the contents of the build folder youself. You can figure out the build path by looking under Tools|Build Settings. Click the “Open” link on the build path, and delete all files there. (You may have to go into the “Interfaces” folder and delete those items first before you can delete the folder). That’s all there is to it! Build now to get a full rebuild, since the old build files have been deleted.